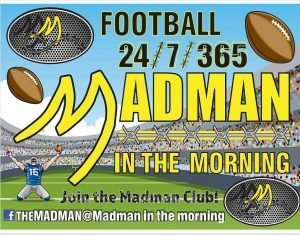 Check out this week’s episode of Madman in the Morning! 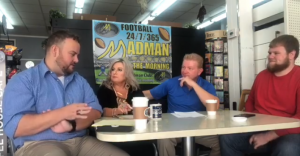 Date: November 8, 2018 Author: CoalField Sports Leave a comment on Check out this week’s episode of Madman in the Morning! “Madman in the Morning was created by Frank “The Madman” Browning. Frank is a 1986 graduate of Tazewell High School. During his time in Kelly green, Browning played for Nick Colobro, Mick Lusk and Dave Lisk. During this timespan, the Bulldogs were 35-9. Frank is a sales manager at Ramey Automotive in Richlands. Frank is in his second year of his show “Madman in the Morning,” which airs on WRIC 97.7 FM and on The Madman’s Facebook @madmaninthemorning each Thursday. The show is filmed at The Coffee House Cafe inside of Randy’s Gateway Drug in Richlands, Virginia. Frank is joined on the show by CoalfieldSports.com writer Zach Helton, Star 95’s Denise “Candy” Shelton, and former Richlands football player & current Ramey Automotive sales professional Brett Compton. 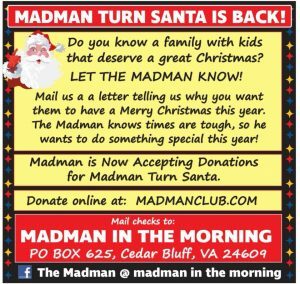 The show is Frank’s platform for “Madman Turns Santa.” “Madman Turns Santa” was started a year ago to help children in the area get the Christmas that they deserve. 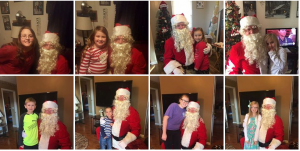 Last year, Browning helped 18 local children have a Merry Christmas. The Madman’s goal this year is to help 40 local children. To nominate a child, all you have to do is send a letter telling of another family with children explaining why they need a Merry Christmas. You can send letters and donations to The Madman P.O. Box 625 Cedar Bluff, VA 24609. We are happy to support The Madman and his goal to make sure every child has a great Christmas.